Switching your effects on and off has become a major topic in the last years. The more different pedals you have in your effects chain the more important it becomes to have a good idea about switching them on and off and what causes what. Many guitarists and bass players have or had issues with “popping” pedals. That means that there is an audible “popp” in your amp when you switch your pedal on or off. This can be quite loud in some cases but even a barely audible noise can become a major problem when playing quite passages. What is causing the “Popp”? The popping noise is usually only present in pedals that have a “True Bypass” kind of switch. If you have this noise in a buffered pedal you should look elsewhere as other components in your signal chain also can cause popping. This starts with using good cables with good connectors (plugs). You will also find out that noise is only present in some setups and (like when replacing the amp) goes away in others. This may have to do with impedance problems between pedals, cables and your amp input. There has been a lot of discussion on what is causing the noise and how it can be prevented. Common knowledge so far is that the input respectively output capacitors in your effect are suddenly discharging when you switch your pedal on or off causing the “popp”. Some players help themselves by switching the pedal on and off a dozend times before the gig to minimize noise – which is actually working with some pedals. Unfortunately the lifespan of the switch will be reduced by doing so. One way to prevent this is to add a grounding resistor (approx. 1M-10M) to your coupling caps in your effect. This will bleed the DC offset they have to ground reducing or eliminating the noise. If your effect already has those grounding resistors you can try to replace the capacitors with different ones that have less DC leakage. Another finding is that the LED indicator is causing the noise when switched. This is very much dependent of the type of LED used and the type of the circuit. If your pedal is properly designed and has some power filtering you are usually fine. Standard LEDs can draw up to 20mA of current when lighting up. This can cause a spike in the power rail of the pedal which will be amlified in the circuit like your guitar input signal. It is obvious that high gain pedals are much more affected by this kind of issue than low gain pedals because of their much higher amplification. 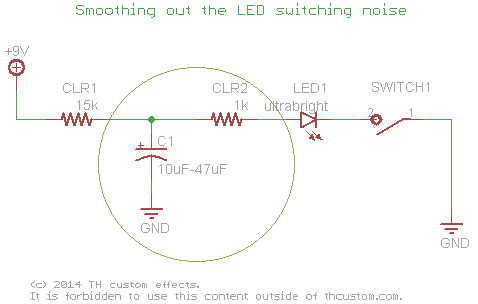 The easiest thing you can do is to use a low current LED which draws only about 2mA. Also using high brightness types and a much higher current limiting resistor with the LED can help. Another solution that requires more work is to add a few components to the LED which smoothly delay the switching of the LED and therefore reduce the spike that can occour. This will also require you to test out the values for CLR1, CLR2 and C1 as no standard values can be given. The values shown in the schematic can be used as a starting point for your own testing.